Margaret K. McElderry Books, 9781442489677, 1088pp. Epic. Bestselling. Award-winning. 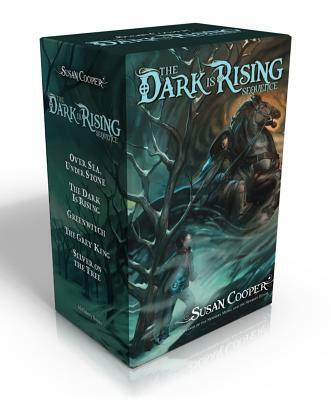 The complete Dark Is Rising Sequence is now available as one keepsake collection. Will Stanton’s ordinary life is shattered with the dreadful revelation that the Dark—the source of all evil—is rising in its last and greatest bid to control the world. He finds that he is no ordinary boy, but the last-born of the Old Ones, immortals dedicated to keeping mankind free from the Dark. Soon Will is swept up in the great battle, along with his ageless master, Merriman; the three Drew children, who are mortal but have their own vital part to play; and a strange boy named Bran. These six fight fear and death in a quest through time and space interwoven with the most ancient myths of the islands of Britain—until, at last, Will and Bran find the weapon that will ultimately vanquish the Dark. One of the most celebrated fantasy sequences of all time, The Dark Is Rising is a searing, epic rendering of the eternal conflict between good and evil. This complete collection includes Over Sea, Under Stone; The Dark Is Rising; Greenwitch; The Grey King; and Silver on the Tree.